In the West we don’t hear much about it, and even in India it doesn’t make many headlines, but Hindu society is faced with a Christian problem besides the better-known Muslim problem. One focus of this conflict is the history of Christian iconoclasm, which is not entirely finished, and which past history has crystallized into some hundreds of churches standing on the ruins of purposely demolished Hindu temples. This history of iconoclasm is not an accident: it is the logical outcome of Christian theology, particularly of its deep hostility towards non-Christian forms of worship. A book well worth reading for those engaged in controversies over sacred sites, in particular concerning Christian churches in South India, is Christians and the Holy Places by Joan Taylor, a historian from New Zealand. It shows that the places where Christians commemorate the birth and death of Jesus have nothing to do with Jesus, historically. The Nativity Church in Bethlehem was built in the fourth century A.D. in forcible replacement of a Pagan place of worship, dedicated to the God Tammuz-Adonis. Until then, it had had no special significance for Christians, who considered pilgrimages to sacred places a Pagan practice anyway: you cannot concentrate in one place (hence, go on pilgrimage to) the Omnipresent. The concept of “sacred place” was introduced into Christianity by converts, especially at the time of Emperor Constantine’s switch to a pro-Christian state policy. The Christian claim to Bethlehem as Jesus’s birthplace was a fraud from the beginning, as Cambridge historian Michael Arnheim has shown: through numerous contradictions and factual inaccuracies, the Gospel writers betray their intention to locate Jesus’s birth in Bethlehem at any cost, against all information available to them. The reason is that they had to make Jesus live up to an Old Testament prophecy that the Messiah was to be born there. Church in Jerusalem was built in forcible replacement of a temple of the fertility Goddess Venus,the personal initiative of Emperor Constantine. His mother had seen in a dream that Jesus had died at that particular place, though close scrutiny of the original Christian texts shows that they point to a place 200 metres to the south. Constantine had the Venus temple demolished and the ground searched, and yes, his experts duly found the cross on which Jesus had died. They somehow assumed that their forebears of 33 A.D. had a habit of leaving or even burying crucifixion crosses at the places where they had been used, quod non. The Christian claim to the site of the Holy Cross is based on the dream of a gullible but fanatical woman, and fortified with a faked excavation. Remember the Ayodhya debate, where Hindu scholars were challenged to produce ever more solid proof of the traditions underlying the sacredness of the controversial site? Whatever proof they came up with was automatically, without any inspection, dismissed by the high priests of secularism as “myth” and “faked evidence”. It was alleged that there was a “lack of proof” for the assumption that Rama ever lived there. But in the case of the Christian sacred places, we do not just have lack of proof that the religion’s claim is true, but we have positive proof that its claim is untrue, and that it was historically part of a campaign of fraud and destruction. The stories of the Nativity and Holy Cross sites were trend setters in a huge campaign of christianization of Pagan sacred sites. Joan Taylor also mentions how the Aphrodite temple in Ein Karim near Jerusalem was demolished and replaced with the Nativity Church of John the Baptist. In the same period, all over the Roman Empire, Pagan places of worship were demolished, sacred groves chopped down and idols smashed by Christian preachers who replaced them with Christian relics which they themselves posted or “discovered” there, like the twenty-odd “only real” instances of Jesus’s venerable foreskin. Pagan symbols and characters were superficially christianized. For example, Saint George and the archangel Michael, both depicted as slaying a dragon, are nothing but Christian names for the Indo-European myth of the dragon-slayer (in the Vedic version: Indra slaying Vrtra). The Pagan festivals of the winter solstice (Yuletide) and the spring equinox were deformed into the Christian festivals of Christmas and Easter. The Egyptian icon of the Mother Goddess Isis with her son Horus in her lap, very popular throughout the Roman Empire, was turned into the Madonna with the Babe Jesus. At the same time, devotees of the genuine Mother Goddess and enthusiasts of the genuine winter solstice festival were persecuted, their temples demolished or turned into churches. This massive campaign of fraud and destruction was subsequently extended to the Germanic, Slavic and Baltic countries. Numerous ancient churches across Europe are so many Babri Masjids, containing or standing on the left-overs of so many Rama Janmabhoomi temples. Just after the christianization of Europe was completed with the forced conversion of Lithuania in the fifteenth century, the iconoclastic zeal was taken to America, and finally to Africa and Asia. India too has had its share of Christian iconoclasm. After the Portuguese settlement, hundreds of temples in and around the Portuguese-held territories were demolished, often to be replaced with Catholic churches. 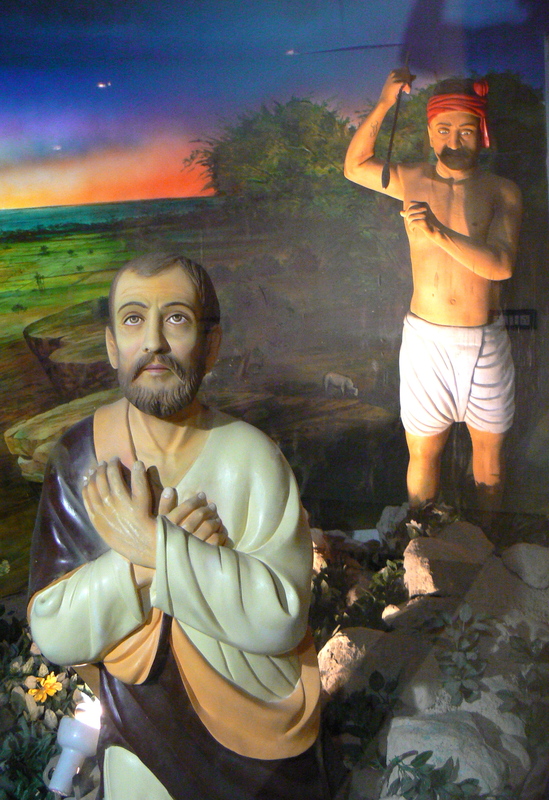 “Saint” Francis Xavier described with glee the joy he felt when he saw the Hindu idols smashed and temples demolished. Most sixteenth and seventeenth century churches in India contain the rubble of demolished Hindu temples. The French-held pockets witnessed some instances of Catholic fanaticism as well. Under British rule, Hindu places of worship in the population centres were generally left alone (some exceptions notwithstanding), but the tribal areas became the scene of culture murder by Catholic and Protestant missionaries. There are recent instances of desecration of tribal village shrines and sacred groves by Christians, assaults on Hindu processions both in the tribal belts and in the south, and attempts to turn the Vivekananda Rock Memorial at Kanyakumari into a Virgin Mary shrine. In South India, the myth of St. Thomas provided the background for a few instances of temple destruction at places falsely associated with his life and alleged martyrdom, especially the St. Thomas Church replacing the Mylapore Kapaleeswara Temple in Madras. In this case, the campaign of fraud is still continuing: till today, Christian writers continue to claim historical validity for the long-refuted story of the apostle Thomas coming to India and getting killed by jealous Brahmins. The story is parallel to that of Jesus getting killed by the Jews, and it has indeed served as an argument in an elaborate Christian doctrine of anti-Brahminism which resembles Christian anti-Semitism to the detail. At any rate, it is a fraud. From those Christian polemists insisting on the St. Thomas narrative’s historicity (I will be the first to welcome the unexpected demonstration of the historicity of traditions dismissed as “myths”), we may at least expect that they tell their prospective converts the whole of the story. They should not omit that it describes Thomas as Jesus’s twin brother (implying that Jesus was not God’s Only Begotten Son) and as an anti-social character who exhausted his royal protector’s patience by luring many women away from their families; and that it relates how Jesus was a slave-trader who was not even above selling his own brother. For a proper way of digesting this dark episode of Christian iconoclasm, we suggest the following two steps. First of all, a full stop has to be put to the surreptitious forms of Christian iconoclasm which are continuing to this very day. It is nonsense to talk of dialogue and communal harmony as long as attempts are still being made to disrupt existing modes of worship. Secondly, Hindus and Christians should take inspiration from the contemporary American attitude towards the horrible story of America’s christianization through culture murder and genocide. After all, the Christian conquests in India and in America are two sides of the same coin. In the 1494 Treaty of Tordesillas, the Pope awarded one half of the world (ultimately comprising areas from Brazil to Macao, including Africa and India) to Portugal, and the other half (including most of America and the Philippines) to Spain, on condition that they use their power to christianize the population. The Spanish campaign in America had juridically and theologically exactly the same status as its Portuguese counterpart in India. If the result was not as absolutely devastating in India as it was in America, this was merely due to different power equations: the Portuguese were less numerous than the Spanish, and the Indians were technologically and militarily more equal to the Europeans than the Native Americans were. The Church’s intentions behind Columbus’s discovery of America and Vasco da Gama’s landing in India were exactly the same. On the occasion of the 500th anniversary of Columbus’s first meeting with the Pagans of the New World (1992), many Christian dignitaries have expressed their shame and regret at what has been done to the Native Americans by (or, as they prefer to put it, “in the name of”) Christianity. Even the Pope has publicly acknowledged at least a part of his Church’s guilt. Now that the 500th anniversary of Vasco da Gama’s landing in India [has passed], Hindus should make sure that the Christians including the Pope do not forget to do some similar soul-searching and to offer similar apologies. Like the Native Americans, Hindu society will not be satisfied with a few cheap words. As Hindu spokesman Arun Shourie writes: “By an accounting [of the calumnies heaped upon India and Hinduism] I do not of course mean some declaration saying, ‘Sorry’. By an accounting I mean that the calumnies would be listed; the grounds on which they were based would be listed, and the Church would declare whether, in the light of what is known now, the grounds were justified or not; and the motives which impelled those calumnies would be exhumed.” This is actually an application of the rules of confession, one of the Catholic sacraments: it is not enough to ask for absolution from your sins, you first have to confess what sins you have actually committed. I expect Church leaders to reply: “You cannot ask of the Indian Church to commit suicide like that!” But let us give them a chance. After the Church’s public self-criticism before the Native Americans, there is every reason [for Hindus] to take stock of what Christianity has done to India. But in this case, the Christians may need some insistent reminding: unlike in America, where they have had to face the facts of history, and where they have had to switch to a pro-Native stand under the aegis of Liberation Theology, the Christian Churches in India are still continuing on a course of self-righteous aggression against the native society and culture. Seldom have I seen such viper-like mischievousness as in the most recent strategies of the Christian mission in India. It is a viper with two teeth. On the one side, there is the gentle penetration through social and educational services, now compounded with a rhetoric of “inculturation”: glib talk of “dialogue”, “sharing”, “common ground”, fraudulent donning of Hindu robes by Christian monks, all calculated to fool Hindus about the continuity of the Christian striving to destroy Hinduism and replace it with the cult of Jesus. This is not to deny that there are some Indian Christians who sincerely believe that the denomination game is outdated, that we should go “beyond the religions” and mix freely with non-Christians without trying to change their religious loyalties; but they do not represent official Church policy. On the other side, there is a vicious attempt to delegitimize Hinduism as India’s native religion, and to mobilize the weaker sections of Hindu society against it with “blood and soil” slogans. Seeing how the nativist movement in the Americas is partly directed against Christianity because of its historical aggression against native society (in spite of Liberation Theology’s attempts to recuperate the movement), the Indian Church tries to take over this nativist tendency and forge it into a weapon against Hinduism. Christian involvement in the so-called Dalit (“oppressed”) and Adivasi (“aboriginal”) movements is an attempt to channel the nativist revival and perversely direct it against native society itself. It advertises its services as the guardian of the interests of the “true natives” (meaning the Scheduled Castes and Tribes) against native society, while labelling the upper castes as “Aryan invaders”, on the basis of an outdated theory postulating an immigration in 1500 B.C. To declare people “invaders” because of a supposed immigration of some of their ancestors 3500 years ago is an unusual feat of political hate rhetoric in itself, but the point is that it follows a pattern of earlier rounds of Christian aggression. It is Cortes all over again: Cortes, the conqueror of Mexico, could defeat the Aztecs, the ruling nation which had immigrated from Utah three centuries earlier, by enlisting the support of nations subdued by the Aztecs, with himself posing as their liberator (of course, they were to regret their “liberation”). The attempt to divide the people of a country on an ethnic basis—whether it is a real ethnic distinction as in the case of Cortes’ Mexico, or a wilfully invented one as in the case of India—is an obvious act of hostility, unmistakably an element of warfare. While in the post-colonial decades, Church rhetoric has markedly softened, its action on the ground has only become more aggressive. Shourie quotes intelligence reports on the role of missionaries in armed separatist movements in the North-East, and on their violations of the legal restrictions in Arunachal Pradesh on conversion by force or allurement. The World Council of Churches officially supports separatism in the tribal areas (and even among the Schedules Castes, another “indigenous nation”! ), in pursuit of the long cherished project of carving out Christian-dominated independent states. In its 1989 Darwin Declaration, the WCC announces: “Indigenous peoples strive for and demand the full spectrum of autonomy available in the principle of self-determination, including the right to re-establish our own nation-states”. The Churches and governments have an obligation to see [this] come to reality by providing the necessary means, without any restriction attached.” What sounds fair enough in the case of the Tibetans or the East-Timorese, is used in India as a step on the way to unrestricted exercise of clerical power, a formalization of the already existing trends in the Christian-dominated states of the Indian republic. Therefore, “without any restriction”, Christians are teaching some sections of Hindu society hatred against other sections. You don’t normally try to create hostility between your friends, so the Church’s policy to pit sections of Hindu society against one another should be seen for what it is: an act of aggression, which warrants an active policy of self-defence and counter-attack. This counter-attack should take a proper form, adapted to the genius of Hinduism. The Hindu response to Christian aggression should concentrate on consciousness-raising. Information should be widely disseminated on the two fundamental reasons why Christianity is totally unacceptable as an alternative to Hinduism. The first is its historical record, with its destructive fanaticism as well as its opportunistic collaboration with whichever social force seemed most helpful to the Church’s expansion. Contrary to current propaganda, Christianity has historically supported feudalism, absolute kingship, slavery and apartheid, all properly justified with passages from the Bible. St. Peter and St. Paul gave a clear message to the oppressed of the world: “Slaves, accept with due submission the authority of your masters, not only if they are good and friendly, but even if they are harsh.” (1 Peter 2:18) And: “Slaves, be obedient to your earthly masters with devotion and simplicity, as if your obedience were directed to Christ Himself.”(Ephesians 6:5). Liberation Theology, far from constituting a break with the Church’s long-standing collaboration with the dominant powers, is merely the application of the same strategy to new circumstances: now that the masses constitute a decisive political force, now that social activism is a theme which ensures political and financial support from different quarters, the Church has decided to tap into this new source of power as well. The other (and in my opinion the most important) fact about Christianity which ought to be the topic of an all-out education campaign, is the scientific certainty that its fundamental teachings are historically fraudulent, intellectually garbled, and psychologically morbid. Jesus was neither the son of a virgin mother nor the Only Begotten Son of God. Jesus’s perception of himself as the Messiah and the Son of God was a psychopathological condition, supported by hallucinations (especially the voice he heard during his baptism, the visions of the devil during his fast, the vision of Elijah and Moses on Mount Tabor), and partly caused by his most ordinary but traumatic shame of having been conceived out of wedlock. Numerous manipulations (interpolation, omission, antedating, deliberate mistakes of translation and interpretation) of the textual basis of Christian doctrine by the evangelists and other Church Fathers have been discovered, analyzed and explained in their historical context by competent Bible scholars, most of them working at Christian institutes. Now some Hindus will object that there must also be a bright side. I am well aware that Christian history has produced some important contributions to human progress in culture, art, philosophy. I have a rather positive opinion of some of the Christian classics, such as Thomas Aquinas’s philosophy, or the Church’s social teachings (which are rather different from Liberation Theology), and I stand by my earlier suggestion that Hindu political ideologues would gain a lot from studying the works which inspired their natural European counterpart, the Christian Democrats. However, a closer analysis shows that the truly important elements in these contributions are ultimately of non-Christian origin. The intellectually most attractive elements in Christian doctrine are bits of Hellenistic philosophy co-opted by the Church Fathers, without any prophetic or revelatory origins, apart from elements of Judaic tradition which predated Jesus and were in no way augmented or surpassed by his supposed teachings. The way Christianity incorporated them is often a superficial cover-up of the contradictions between mutually exclusive teachings. Thus, the Platonic notion of an immortal soul, which is part of Church doctrine, makes the central Christian message of the “resurrection of the body” (which originated in a Jewish tradition ignoring the notion of an afterlife) superfluous. If death does not really exist, if it is merely a step from this type of life to another type, why bother about bodily resurrection? And if we partake of the Divine nature by sharing God’s immortality, where is the need for a Saviour? On the other hand, those contributions which set Christianity apart from the prevailing religious and intellectual atmosphere in the Greco-Roman world, are not always the most desirable. Thus, Christianity’s emphasis on the individual’s dependence on Scriptural or Church authority has suffocated millions of people in their spiritual development and directly caused the persecution and killing of numerous freethinkers. Its contorted and repressive attitude towards human sexuality is notoriously responsible for untold amounts of psychological suffering. Add the negative attitude towards worldly pursuits including science; the sentimental fixation on a single historical person with his idiosyncratic behaviour, extolled moreover to a divine status (Jews and Muslims have a point when they consider this the ultimate in “idolatry”); the concomitant depreciation of all other types of human character (artist, warrior, householder, humorist, renouncer) in favour of the pathetic antisocial type which Jesus represented; and the morbid love of martyrdom. Our list of Christianity’s failures is not complete, but is sufficient to justify the evaluation on which millions of Christian-born people have come to agree: Christianity is not true. Jesus was not God’s Only Begotten Son, and he was not the Saviour of mankind from its Original Sin. Historically, he was just one of the numerous antisocial preachers going around in troubled Palestine in the period of Roman rule. He believed the End was near (definitely a failed prophecy, unless we redefine “near”), and had a rather high opinion of himself and of his role in the impending catastrophe. We can feel compassion for this thoroughly unhappy man with his miserably unsuccessful life, but we should not compensate him for his failure by elevating him to a super-human status; let alone worshipping him as Saviour and Son of God. Whatever the worth of values which Christians claim as theirs, nothing at all is gained by making people believe in a falsehood like the faith in Jesus Christ. Hindus with their conservative and pluralistic concern for the continuity of people in their respective faiths may wonder whether, for Christians, there is life after Christianity. Let me speak from my own experience. I have grown up in a Catholic family, gone to Catholic schools, and am a member of Catholic social organizations, so in a sociological sense I belong to the Catholic community. Moreover, I publish articles defending the Christians against the Islamic onslaught in foreign countries as well as against cultural aggression by Left-secularists in my own country. I also like to point to the worthwhile contributions of the Church tradition and of Christian thinkers and artists against the sweeping anti-Christian positions of some of my atheist and Hindu friends. Yet, like most of my friends from the same background, I have gradually discovered that Christianity is an illusory belief system, and without any outside intellectual or other pressures, my attachment to it has dissolved. For many thoughtful Westerners, the end of Christianity has not turned out to be the end of religion and morality, contrary to the predictions of our teachers. To be sure, there has been a profound change in public morality, which is partly a liberation from repressive prejudice, but partly also a real decline in moral sensitivity and responsibility, as demonstrated by the rising crime rate and the increasing number of broken families. Christianity claims to be the solution to this problem (hence the call for a “second evangelization”), but to quite an extent it should accept the blame for this development. By identifying religiosity and morality with its own irrational belief system, Christianity has made many people who outgrew this belief system throw out the annexes of moral responsibility and spiritual striving as well. Now, people are needing some time to discover for themselves that religion and morality still make sense after the demise of Christianity. Though the decline of Christianity in the West brings a few problems with it, that is no reason to reverse the process. Instead, we are reconstructing religion and morality for ourselves. One of the sources of the post-Christian religious revival, numerically still marginal but of great symbolic significance, is the rediscovery of ancestral Paganism. Intellectually, this movement still lacks solidity and consistency, and finds itself associated with a variety of social and political concerns stretching across the ideological spectrum: ethnic revivalism, nationalism, ecologism, feminism, communitarianism, anarchism. Part of the reason is that in European Paganism, unlike in Hinduism, there is no historical continuity, so that (except for the well-documented Greek traditions) there is ample room for guessing and fantasizing about the historical contents of ancient Paganism: an open invitation to romantics and theosophists to project their own pet ideas onto the mute screen of the ancient religion. Perhaps that is why the most consistent neo-Pagan movement arose in Iceland, where the memory of ancient Paganism was best preserved. When Pope John-Paul II visited Iceland, he was received by Christian dignitaries, but the first one to address him was the country’s senior most religious leader, Sveinbjšrn Beinteinsson (1924-93). Originally a farmer, Beinteinsson gained fame across northern Europe as a traditional singer and songwriter (what the English call, with a term from the Celtic part of their cultural ancestry, a bard), and in 1972 he founded the Asatruarflagid, the “society for the Ase religion”, which was officially registered as a religion on 3 May 1973. As “the whole people’s invocator” (Allsherjargodi) of the reconstituted ancestral religion, he spoke with mild irony to the Pope, about these “new fashions in religion” (meaning Christianity) which his tradition had seen arriving in Iceland. The Icelandic example is being followed in other Germanic countries including North America. Celtic-based revivals are flourishing in Celtic countries or countries with a Celtic past (France, where some 40 different neo-Druid societies of divergent quality co-exist, England and Belgium). Slavic and Baltic countries have their own variety, with Russia and Lithuania being particularly fertile grounds for neo-Paganism. In the former Soviet provinces of Tajikistan and Ossetia, there is a revival of Zoroastrianism, while forms of Shamanism are resurfacing from Kyrgyzstan to Hungary. In North America, these movements are partly absorbing those circles which were flirting earlier with Native American spirituality (sweat lodge ceremony). They now accept that the Native Americans themselves don’t appreciate this type of imitation and prefer European-descended people to rediscover their own Pagan heritage. While evangelists are working hard to christianize tribals in the interiors of Latin America, many christianized Native Americans are returning to their ancestral traditions. In Brazil, supposedly the world’s largest Catholic country, the black and mulatto populations are taking to the elaborately polytheistic Candombl cult, with the sympathy of growing sections of the European-descended people, who view this cult of African origin as the emerging national religion. Most of these neo-Pagan groups are still too obviously immature, groping in the dark created by the Christian destruction of their historical roots; it is interesting to watch some of them adapt their own rituals and doctrines to new scholarly findings about their chosen religious ancestry. We shall have to see how this line of response to the post-Christian vacuum develops; but already, its very existence poses a powerful symbolic challenge to Christianity. Meanwhile, the biggest actual challenge to Christianity in the West is the appeal of Oriental religions. Now long past the stage of beatnik experimentation with Zen Buddhism and hippie affectations of Indian lore, the Western daughter-schools of Asian schools of Hinduism, Buddhism and Taoism are gaining in authenticity and respectability as well as in attendance numbers. Some people formally convert and declare themselves followers of these religions; many more just practise the techniques they’ve learned and try to live according to the teachings, all while insisting on their individual non-attachment to any organized religion. Thus, in Germany (at least among natives, as opposed to the prolific Muslim immigrants), Buddhism is the fastest growing religion with some 300,000 practitioners. Even more far-reaching is the gradual penetration of small bits and pieces of Oriental heritage: most sportsmen as well as pregnant women preparing for birth now learn some elementary yogic breath control (prānāyāma) techniques, while even among Christian monks and nuns there is a substantial percentage who defy the Pope’s warnings and practise non-Christian forms of meditation. Part of Christianity’s appeal among Indian tribals and fishermen is the (waning, but still palpable) prestige of the West. They should realize that the West is gradually opening up to the traditions of India and China, even while the elites of these countries are still spitting on their own heritage and pursuing westernization. Indians living in the middle of these traditions should have no problem finding a worthwhile alternative to Christianity. Even Dalits with a grudge against Hinduism should have no problem in rejecting the eager invitations of Christianity and Islam, and in following their leader Dr. Ambedkar onto the path of the Buddha. In time, closer study of the Buddha’s teachings may well reveal to them that, just as Jesus was a Jew, the Buddha was a Hindu. It is interesting to see how the mild and harmless people who run the leftovers of the once powerful Churches in Europe suddenly show a streak of fanaticism when confronted with signs of life in the long-buried corpse of Paganism. In Iceland, the established Lutheran Church has intervened to stop the ongoing construction of a Pagan temple halfway; the government complied with the pressure and temporarily halted the construction work. In contemporary polemical publications from the Christian side, we see a boom in attacks on what is loosely called the New Age movement, meaning the mixed bag of feminist neo-witchcraft, ecologist philosophy (“deep ecology”), astrology, Pagan revivalism, Taoist health techniques and Hindu-Buddhist meditation. The Pope himself has condemned yoga, and in January 1995, his derogatory utterances on Buddhism provoked an anti-Pope agitation during his visit to Sri Lanka. By contrast, the Church leadership strongly opposes any serious criticism of Islam. In India’s Hindu-Muslim conflict, the Christian media with their world-wide impact have thrown their weight completely behind the Islamic aggressor. The reason for this uneven treatment of Paganism (in the broadest sense) and Islam is not merely the relative closeness of Islam as a fellow monotheist religion, nor just the fear which Islam inspires. Churchmen have the (correct) impression that the Pagan alternative, though softer and weaker than Islam in a confrontational sense, ultimately has a stronger appeal to the educated Western mind. They calculate that the better-educated mankind of the next century will typically go the way of today’s European intellectuals, rather than the way of today’s Black Muslims or Christian Dalits. Islam’s money and muscle power may look impressive, certainly capable of doing some real damage to targeted countries and societies, but Islam has no chance of becoming the religion of a science-based, space-conquering world society. Exclusivist revelations have no appeal among educated people, especially after they have acquainted themselves with the Vedantic or Buddhist philosophies. That is why the Churches are investing huge resources in the battle for Asia’s mind, where they face their most formidable enemy. That is why they are so active in India: not only is India’s atmosphere of religious freedom more hospitable to them than the conditions of Islamic countries, or even of non-Islamic countries where proselytization is prohibited (countries as divergent as China, Myanmar, Israel, and, at least formally, Nepal); but they also know and fear the intrinsic superiority of the Indian religion. In the present struggle to death which Christianity is waging against Hinduism, is it any use for Hindus to rake up disputes over usurped places of worship? Or, as Christians who have the preservation of their churches in mind, are wont to ask: isn’t one Babri Masjid problem enough? The Hindu response should be in proportion to the seriousness of the matter. Within the hierarchy of Hindu sacred places, I don’t think that any of the most important ones has been usurped by Christianity, the Mylapore Shiva Temple being (with due respect) of secondary rank; though I admit that this is all relative. Of course, the Church itself is welcome to make a move and offer the stolen places of worship back. In fact, until the Church voluntarily offers to give some of its illegitimate property back, there is every reason to be skeptical about its protestations of a “new spirit of dialogue”. However, in my opinion, it may be wasteful and strategically counterproductive to start clamouring for the return of stolen places of worship. Hindu society should be more ambitious. A place of worship may be an important focus for mobilization and consciousness-raising (vide Ayodhya), but it is hardly important in itself. Better to go for the big one: attract the worshippers, and they will bring the places of worship along with them. Not the places but the offerers of worship are to be liberated from Christianity. The fate of Hindu sacred sites at the hands of Christian missionaries, as a piece of significant historical information, may have a certain auxiliary role to play in this process of consciousness-raising. Their ruins are witnesses to the antireligious and destructive edge of a Church which now advertises itself in India as the bringer of progress and social justice. A formal “liberation of sacred sites” need not be put on the agenda, but the Hindus have every right to insist on a mental and verbal breakthrough: Christians must acknowledge the historical fact that, from Bethlehem to Madras, most of their sacred sites are booty won in campaigns of fraud and destruction. Since their theology urges a sense of sinfulness and guilt anyway, they should not find it too difficult to make such a confession. Joan Taylor: Christians and the Holy Places, Oxford University Press 1993. Michael Arnheim: Is Christianity True?, Duckworth & Co., London 1984. The church is known today as the Church of the Holy Sepulchre. It was built to enclose the alleged sites of the cross and the tomb which were believed to the close to each other. Its first building was dedicated ca. 336 A.D. In their own version of the winter solstice, the Romans celebrated December 25th as the birthday of Mithra, the Sun of Righteousness, at the close of their most popular festival, the week-long Saturnalia. January 1st was then celebrated as the beginning of the New Year. The contention of Protestant fundamentalists that Christmas, the New Year and Easter are Pagan festivals is correct. The names of the days of the week and months of the year in the Western “Christian” calendar are also of Pagan origin, as is the choice of Sunday as the designated holy day. The phenomenon of Christian violence against Hindus in South India, generally ignored by Western India-watchers, is briefly mentioned by Susan Bayly in her (otherwise anti-Hindu) article: “History and the Fundamentalists: India after the Ayodhya Crisis”, in Bulletin of the Academy of Arts and Sciences, April 1993. The problem has hardly been documented by Hindu organizations, with their usual slothfulness in gathering and providing information. One of the few exceptions is Thanulinga Nadar: Unrest at Kanyakumari, Hindu Munnani, Kanyakumari 1982. In Roman days and long afterwards, “India” was practically synonymous with “Asia”, from Ethiopia to Japan. Columbus expected to reach Zipangu (ChineseRibenguo, “land of the sun’s origin”, i.e. Japan), and when he thought he got there, he called the inhabitants “Indians”. 9] Pope John-Paul II had even announced a comprehensive statement of the Church’s guilt by the year 2000. This provoked a lot of protest from other Church dignitaries. Arun Shourie: Missionaries in India: Continuities, Changes, Dilemmas (ASA Publ., New Delhi 1994), p.229. The book is an expanded version of his lectures before a conference called by the Catholic Bishops’ Conference of India. Its publication provoked a new round of debate (rather less friendly, this time) of which the proceedings are being published by Voice of India: Arun Shourie and His Christian Critic. Op.cit., p.234-235. A study yet to be written might usefully add some research into the complicity of Indian politicians. Thus, I know a Jesuit missionary working in Chhotanagpur, expelled from India by the Rajiv Gandhi administration because of political agitation. Back in Belgium, already preparing to move to another country, he received news that the new (Janata Dal) government would extend help to whomever the Hindus disliked; he applied for a visa and is now back among his flock practising Liberation Theology. I won’t doubt the man’s honesty (“I was only agitating against the redeployment of tigers in the jungle by urban ecologists who value wildlife more than tribal people!”), but the point is that any Christian agitation and intrigue will be supported by other factions of India’s colourful anti-Hindu coalition. Published in Link, the bimonthly newsletter of the WCC’s “Programme to Combat Racism”, 1989/4. This is not to deny the merits of some Christians at some stages in the struggle against slavery, e.g. the Jesuits in Brazil and Paraguay in the 17th and 18th century, and the Quakers in the USA in the 19th century. But remark that the Jesuit efforts were stopped by the Church itself, and that in the 18th century, the Quakers had been quite well-represented among slave-owners themselves. Christianity as a doctrine cannot claim the honour of freeing the oppressed. For a synthesis of the findings of critical Bible scholarship with the proper logical conclusions, however, we have to refer to studies by non-Christian or ex-Christian scholars, because Christians tend to avoid the consequences of their findings (e.g. by claiming that “the Jesus of history” is unknowable and unimportant). See e.g. Michael Arnheim: op.cit. ; Robin Lane-Fox: The Unauthorized Version. Truth and Fiction in the Bible, Viking, London 1991; and Herman Somers: Jezus de Messias: Was het Christendom een Vergissing? (“Jesus the Messiah: Was Christianity a Mistake?”), EPO, Antwerp 1986. For example Jacques Maritain’s seminal book Humanisme Integral (1936); the title should ring a bell among Hindu nationalist ideologues professing “integral humanism”. Ase is the ancient Germanic word for “God”, cognate to Sanskrit Asura (which simply meant “Lord” before the wars between the Vedic people and the Asura-worshipping Iranians gave it a negative meaning). Godi, like its Sanskrit cognate hotr, means “worshipping priest”; hence the related Germanic word God, “the worshipped one”. In 1993, he was succeeded by Thorstein Gudjonsson. The Asatr Society publishes a periodical, Huginn ok Muhinn, PO Box 1159, IS-121 Reykjavik. Lithuania, even more than Iceland, has a fair claim to some threads of continuity with historical Paganism because of its late christianization. Historians are gradually bringing more reliable information to light, a prime example being Ronald Hutton: The Pagan Religions of the Ancient British Isles, Blackwell, Oxford 1993. Often, this research highlights both the limitations of our knowledge of ancient Paganism, and the distance between the original and the imagined Paganism (esp. Druidry) of Theosophy or the Wicca movement. It certainly makes neo-Pagans envy the comfortable situation of Hindus with their uninterrupted age-old tradition. For example, in May 1993, a lecture series on Islam, organized by a Catholic foundation, and in which I (K.E.) was one of the speakers, was prohibited at the last minute by the authorities of the Jesuit University in Antwerp. List of Historians of the 1st to 3rd Century: These are the historians who were contemporary or near contemporary to Jesus but who had absolutely nothing to say about him! Articles and images on this web site which contain copyright material that has not been specifically authorized for use by the copyright owner, has been made available here without commerce to advance learning and to inform the Hindu community at large of issues that may concern it. We believe this constitutes “fair use” of copyright material as understood in Indian and US copyright law.